Artist's conception of the 209,000-dwt Alaska-Class tanker. The NASSCO-designed tankers will be the largest ships yet built on the West Coast. Each will be 987 feet in overall length, 166 feet in beam, 88 feet in depth, and will have a 641/2-foot draft in loaded condition. Propulsion will be by slow-speed diesel, capable of maintaining an average speed of 16% knots. Keel-layings will take place dur- ing the third and fourth quarters of 1985, with deliveries scheduled for the fourth quarter of 1986 and the first quarter of 1987, respectively. Morrison-Knudsen Company, Inc. of Boise, Idaho. Repair and conver- sion of existing ships have been the yard's principal activities in recent years. "NASSCO is acutely aware of the fact that the current demand for new ships, both military and com- mercial, is far less than is needed to maintain the current shipbuilding base," he said. 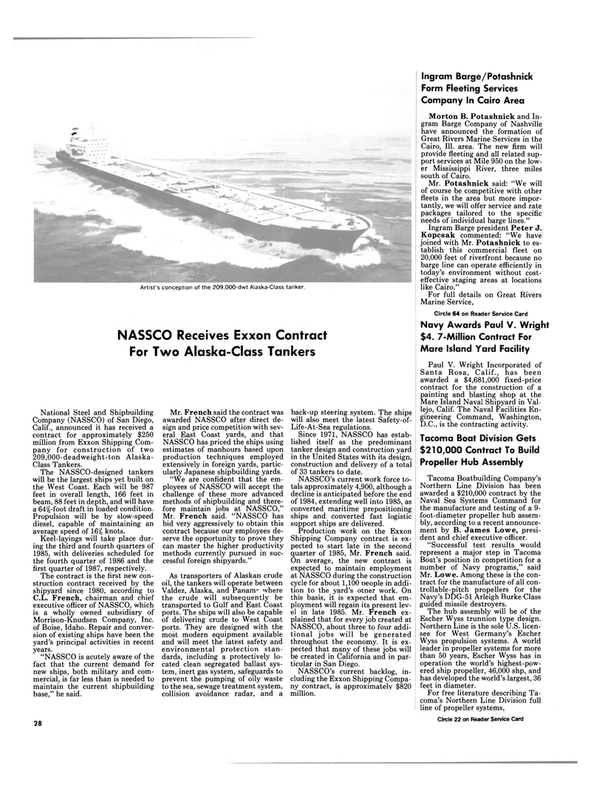 NASSCO has priced the ships using estimates of manhours based upon production techniques employed extensively in foreign yards, partic- ularly Japanese shipbuilding yards. "We are confident that the em- ployees of NASSCO will accept the challenge of these more advanced methods of shipbuilding and there- fore maintain jobs at NASSCO,"
Mr. French said. "NASSCO has bid very aggressively to obtain this contract because our employees de- serve the opportunity to prove they can master the higher productivity methods currently pursued in suc- cessful foreign shipyards." Since 1971, NASSCO has estab- lished itself as the predominant tanker design and construction yard in the United States with its design, construction and delivery of a total of 33 tankers to date. NASSCO's current work force to- tals approximately 4,900, although a decline is anticipated before the end of 1984, extending well into 1985, as converted maritime prepositioning ships and converted fast logistic support ships are delivered. Shipping Company contract is ex- pected to start late in the second quarter of 1985, Mr. French said. NASSCO, about three to four addi- tional jobs will be generated throughout the economy. It is ex- pected that many of these jobs will be created in California and in par- ticular in San Diego. NASSCO's current backlog, in- cluding the Exxon Shipping Compa- ny contract, is approximately $820 million. Cairo, 111. area. The new firm will provide fleeting and all related sup- port services at Mile 950 on the low- er Mississippi River, three miles south of Cairo. Mr. Potashnick said: "We will of course be competitive with other fleets in the area but more impor- tantly, we will offer service and rate packages tailored to the specific needs of individual barge lines." Ingram Barge president Peter J.
Kopcsak commented: "We have joined with Mr. Potashnick to es- tablish this commercial fleet on 20,000 feet of riverfront because no barge line can operate efficiently in today's environment without cost- effective staging areas at locations like Cairo." D.C., is the contracting activity. Navy's DDG-51 Arleigh Burke Class guided missile destroyers. Escher Wyss trunnion type design. Wyss propulsion systems. A world leader in propeller systems for more than 50 years, Escher Wyss has in operation the world's highest-pow- ered ship propeller, 46,000 shp, and has developed the world's largest, 36 feet in diameter.